If you miss the spongy, delicious, crisp-topped, moist, and fluffy deliciousness of honest-to-goodness focaccia, this recipe is for you. Straight from Manhattan’s award-winning Del Posto restaurant (where they go out of their way to accommodate GF diners with world-class options), this gluten-free focaccia leaves nothing to be desired. 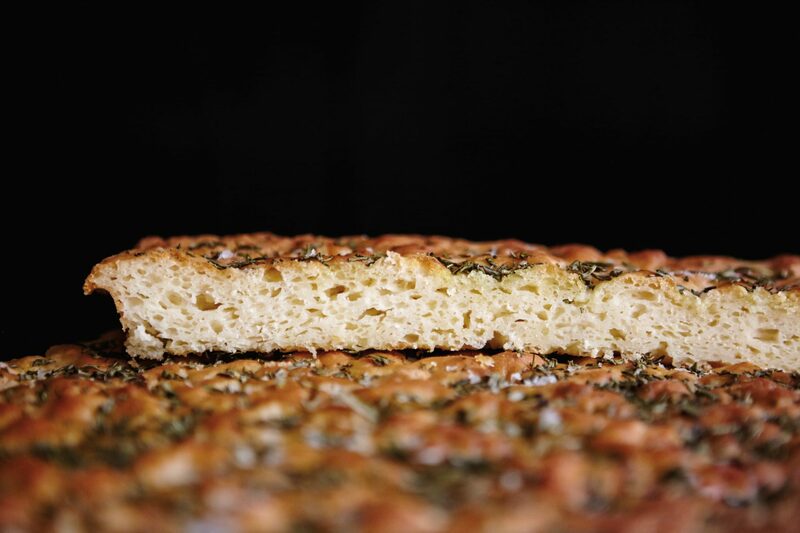 Decadent ingredients yield equally indulgent results with this moist, golden, and superbly flavored focaccia recipe from Manhattan’s famed Del Posto restaurant. Be careful: The minute it’s out of the oven it practically dares you not to eat the whole pan. To ensure its light, airy consistency, be sure to stir the ingredients together very gently and sink your fingers into the well-oiled dough multiple times before putting it in the oven. Also note: the restaurant uses Cup4Cup and Bob’s Red Mill flour, with fantastic results. Using other GF flour will vary the results, but if you use quality GF flours, it should still be delicious. Combine the seltzer water, sugar, and yeast in a large bowl, and stir gently with a wooden spoon to combine. Don’t worry if some of the yeast clumps, and don’t use a whisk to stir; you want the seltzer bubbles to remain intact. Sift together the flours and 1 tablespoon salt, and very slowly add the flour to the combined wet ingredients, stirring by hand with a rubber spatula until the dough comes together. Grease the bottom and sides of an 8-by-8-inch cake pan with 4 tablespoons olive oil. Put the dough into the pan, gently pressing it into shape. Top the dough with the remaining 4 tablespoons olive oil. Using all 10 fingers, gently poke deeply into the dough multiple times to aerate it, then let the dough rest for 1 hour. Preheat the oven to 350oF. Top the focaccia dough with 11⁄2 teaspoons salt and the rosemary. Bake in the middle of the oven for 25 to 30 minutes or until golden brown. Cool to warm, then slice and enjoy.